Several people may carry the title of inventor of the typewriter. Several typewriters may fight over the title of first production machine. Only two machines are regarded as 'the holy grail of typewriters'. The Hansen name is the only one to compete strongly in all three categories. Although the Sholes & Glidden is generally regarded as the first production typewriter in history, the Hansen writing ball in fact beat the S&G by no less than four years. The reverend Rasmus Hans Malling Johan Hansen (1835-1890) worked as a teacher and as director of an institution for the deaf and dumb in Copenhagen. It was his desire to enable his pupils to 'speak with their fingers' that led him to develop his writing ball. 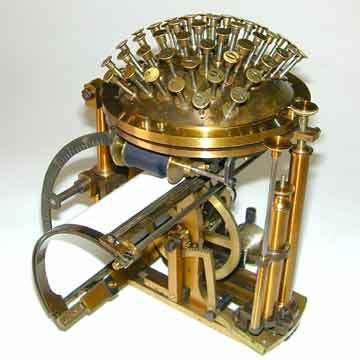 Typing and carriage return of the Hansen writing ball. There are so many amazing aspects about this machine, that Hansen certainly deserves the title of 'inventor' as much as Sholes or Mitterhofer did. And finally, with an effective auction value of over 120,000 euros (april 2002), the Hansen claim to be the Holy Grail of Typewriters is no joke. And one look at the machine makes it clear that it is without a doubt the single most beautiful typewriter ever made. An 1875 patent model, demonstrating an improvement to the escapement of the writing ball. The most striking feature of the writing ball is the semi-sphere on top of the machine, with 52 keys sticking out like a giant pin cushion. At the lower end of each stem is a character, cast in exactly the right angle to create a perfectly even print on the central printing point under the ball. The escapement mechanism moved the paper frame that held the paper one space until the end of the line was reached. By pushing the button on the left in front of the ball all the way down, the carriage was turned concentrically back to the beginning of the line and moved one line to the left. Hansen's first model was built in 1865. The oldest remaining model (dated 1867) even has an escapement that was controlled by an electromagnet, making the Hansen even the first "electric" typewriter in history. Hansen constantly developed his machine further. The initial models had a flat carriage, that was later replaced for the cylindrical model shown here. 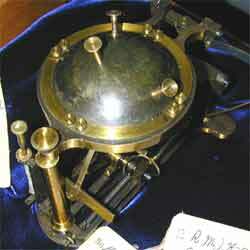 There was a telegraphic model, a cryptographic model and a model for the blind. Hundreds of writing balls were produced and they were fairly widely sold. During the 1878 international exposition in Paris, 10 machines were ordered even by a client in Peru. Other machines were sold all over Europe and the United States. Finally, where the Sholes & Glidden is documented to have been used by the great Mark Twain, the Hansen also had a world famous user: philosopher Friedrich Nietzsche. Only a handful of writing balls are known to exist today.